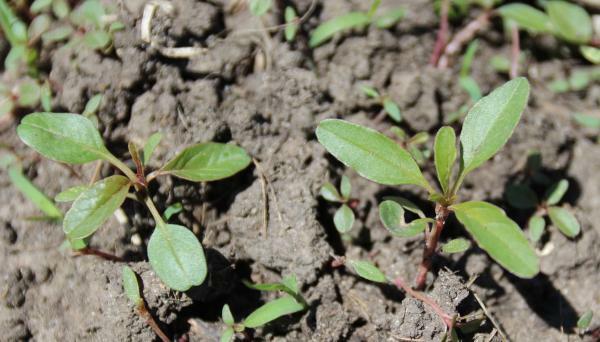 Is it time to scout CRP for Palmer amaranth? I decided to take advantage of the great weather and see if Palmer amaranth could be identified in CRP fields where it was introduced last year. I went to one field in Boone County and another in Story County. 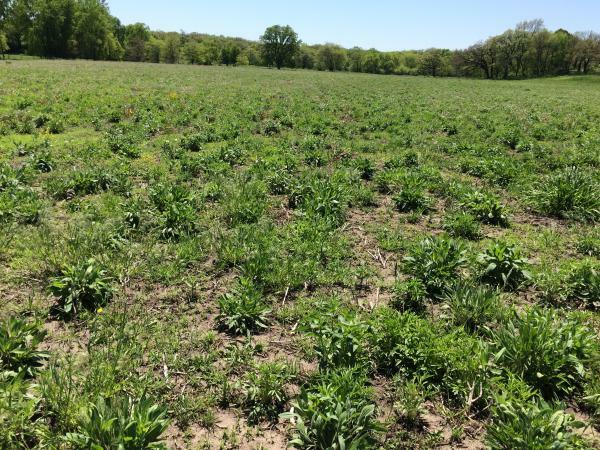 I was happy to find that both fields had good stands of forbs that will compete with annual weeds that emerge throughout the season (Figure 1). Figure 1. Diverse mix of forbs, and some perennial weeds, in a second year pollinator habitat planting. The first field had been burned earlier in the spring, thus there was a lot of bare soil, a requirement for annual weeds. I found scattered patches of Amaranthus (pigweed) seedlings, along with a variety of other crop weeds. I suspect some of the Amaranthus seedlings were Palmer amaranth, but I wasn't very confident in their identification. The plant on the left has broader leaves and longer petioles than I associate with waterhemp seedlings, and thus I think it might be a Palmer seedling (Figure 2). Figure 2. A potential Palmer on left, a potential waterhemp on right. The second field had fairly dense cover from last year's vegetation, thus there were very few annual weeds present at this time. The soil in the first field would have warmed up much quicker due to burning leaving the soil bare to absorb radiant energy, promoting earlier emergence of annual weeds. Rather than randomly look for Amaranthus seedlings, I searched for remnants of Palmer plants from 2016. In a short time I was able to find three corpses that I was confident were female Palmer amaranth (Figure 3). I failed to find any Amaranthus seedlings under the first two Palmer corpses, but did find a few cotyledon stage seedlings under the third (Figure 4). Although I suspect they were Palmer plants due to their proximity to a female plant, there were no traits visible that would allow a person to determine which Amaranthus species they were. Figure 3. Bracts on a Palmer amaranth remnant (12 May 2017). Figure 4. 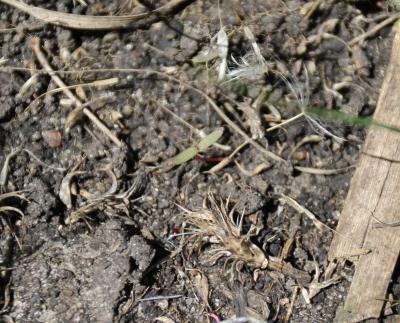 Poor photo of a suspected Palmer amaranth seedling next to remnant of a Palmer inflorescence. The only way to minimize the impact of last year's introduction of Palmer amaranth is to increase our vigilance for the weed. Based on my field trip today, I think we are several weeks away from when we can confidently differentiate the numerous Amaranthus species found in Iowa. 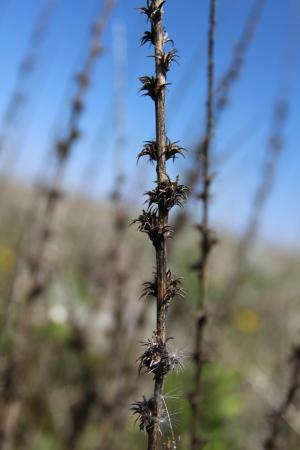 By early to mid-June many Palmer amaranth plants should start to develop the long petioles that are the most reliable vegetative trait to differentiate it from waterhemp and its other weedy relatives.